Sen. Len Suzio on May 25 applauded the State Senate’s passage of his legislation to prevent any state taxpayer dollars from being used to study a potential Connecticut mileage tax. The bill now heads to the House of Representatives. Suzio, who serves as Vice-Chair of the legislature’s Transportation Committee, said he was pleased to see unanimous support for his bill. 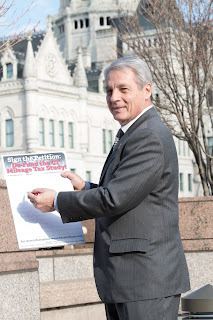 Suzio’s petition to de-fund the by-the-mile tax study at www.SenatorSuzio.com has been signed by hundreds of taxpayers. Suzio said the legislation aims to make good on his campaign pledge to defeat the Mileage Tax. He urged taxpayers to call the House of Representatives to urge passage of Senate Bill 76: An Act Concerning The Power of the Commissioner of Transportation to Conduct a Mileage Tax Study With State Funds. *Suzio represents Cheshire, Meriden, Middlefield, Middletown and Rockfall. He can be reached at Len.Suzio@cga.ct.gov or call 800-842-1421. Photo: Outside the State Capitol, Sen. Len Suzio displays his petition to prevent state taxpayer dollars from being used to study a potential Connecticut Mileage Tax. Hundreds of Connecticut taxpayers have signed Suzio’s petition. Suzio’s pro-taxpayer legislation received the unanimous support of the Connecticut State Senate on May 25. The bill now heads to the House of Representatives.